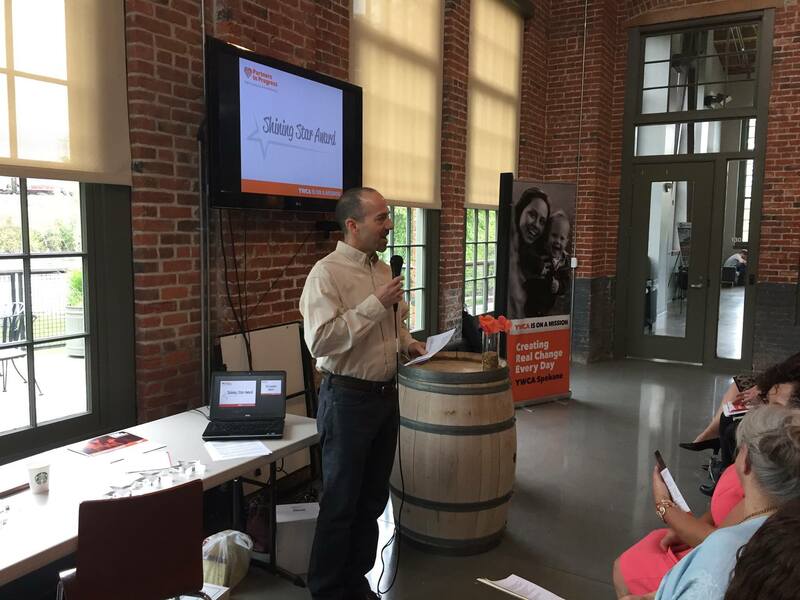 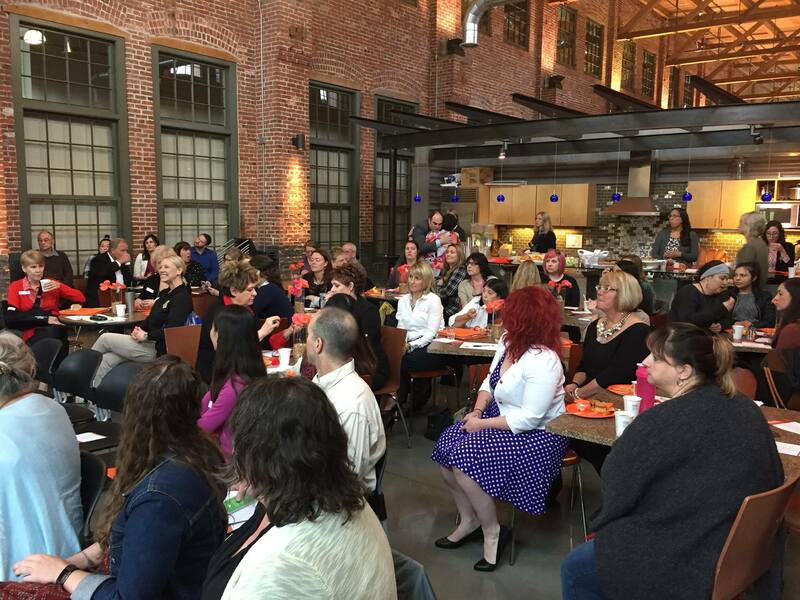 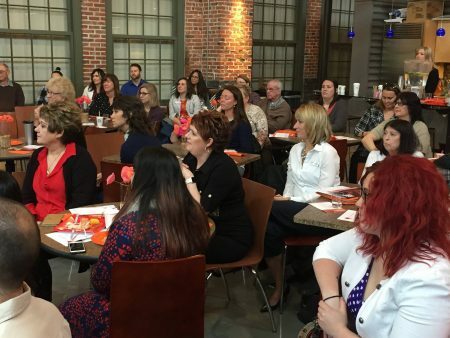 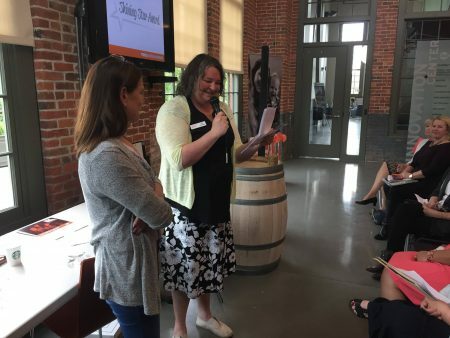 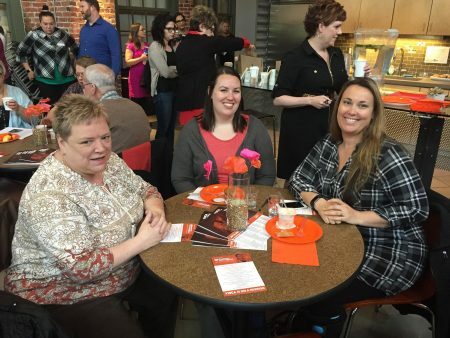 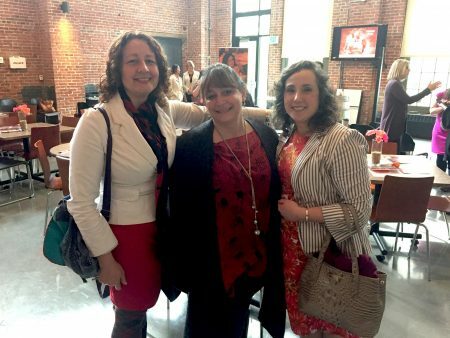 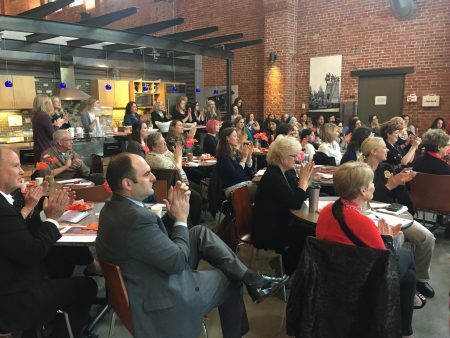 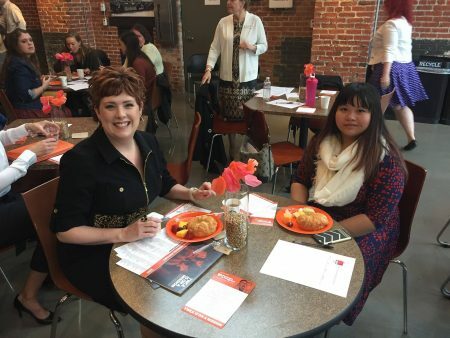 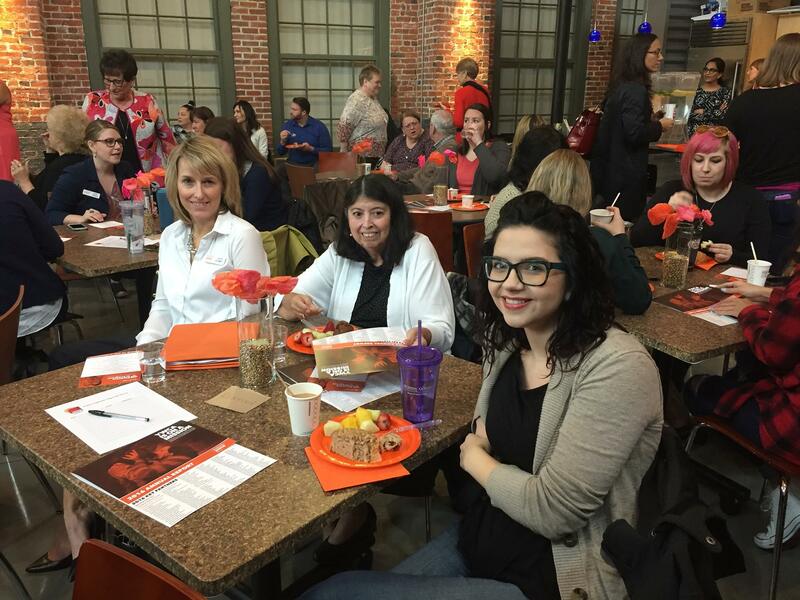 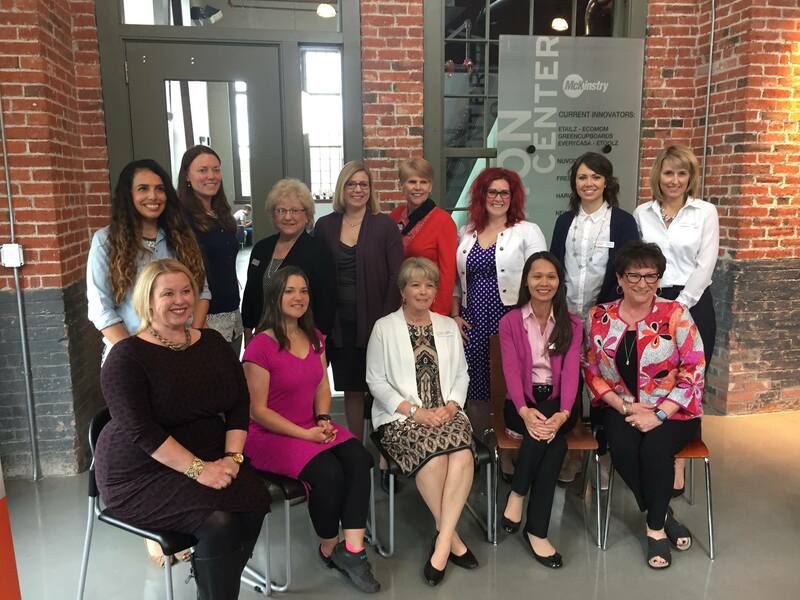 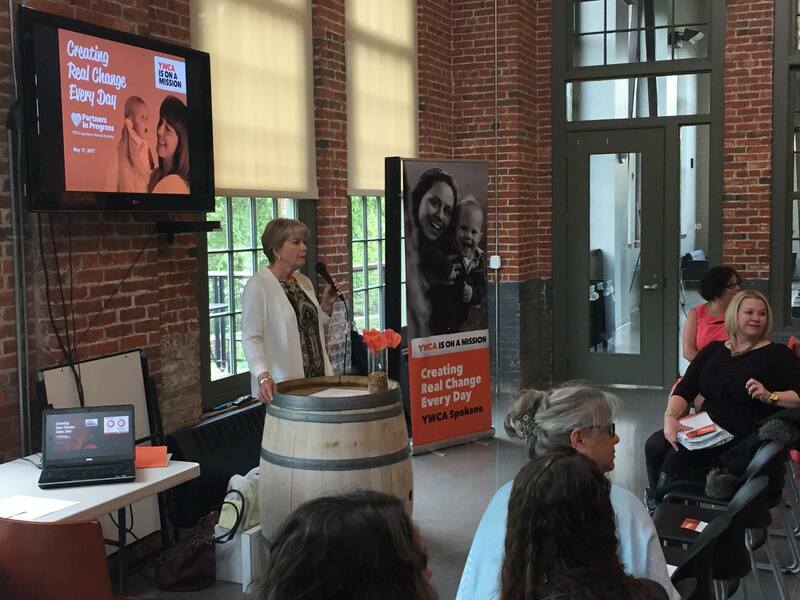 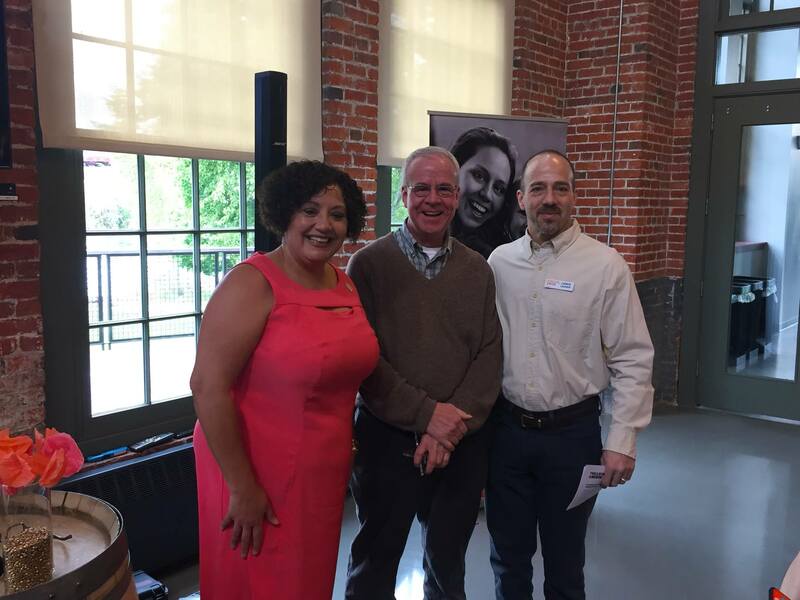 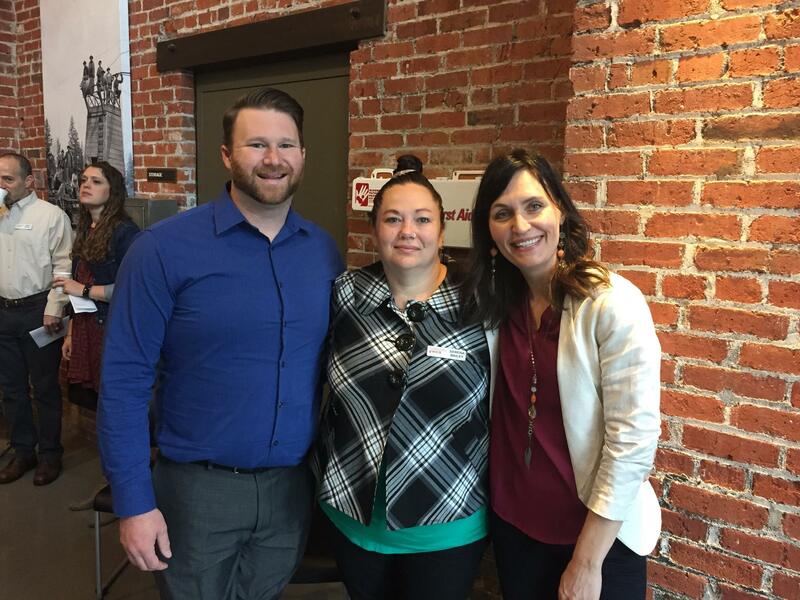 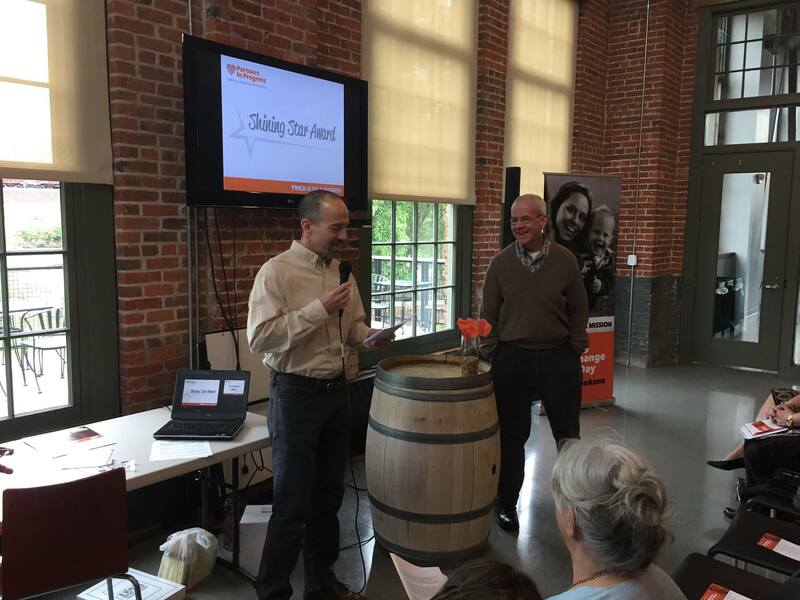 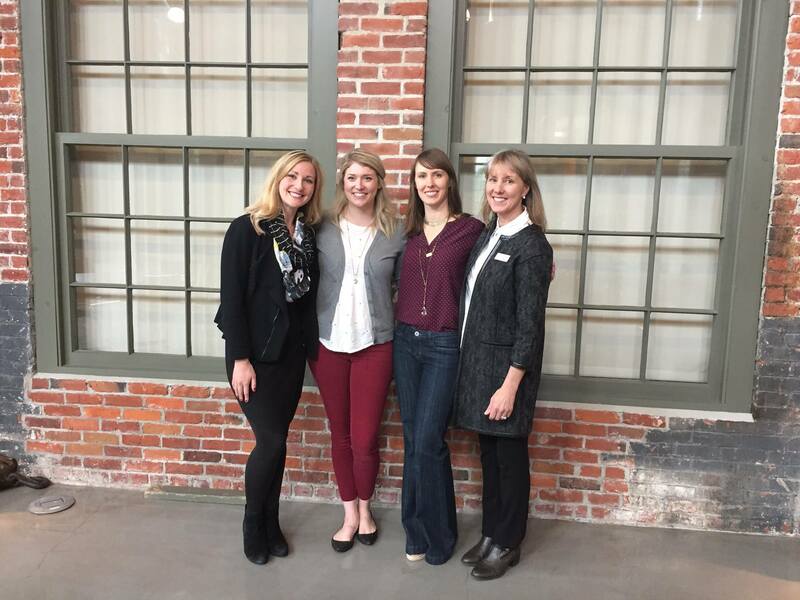 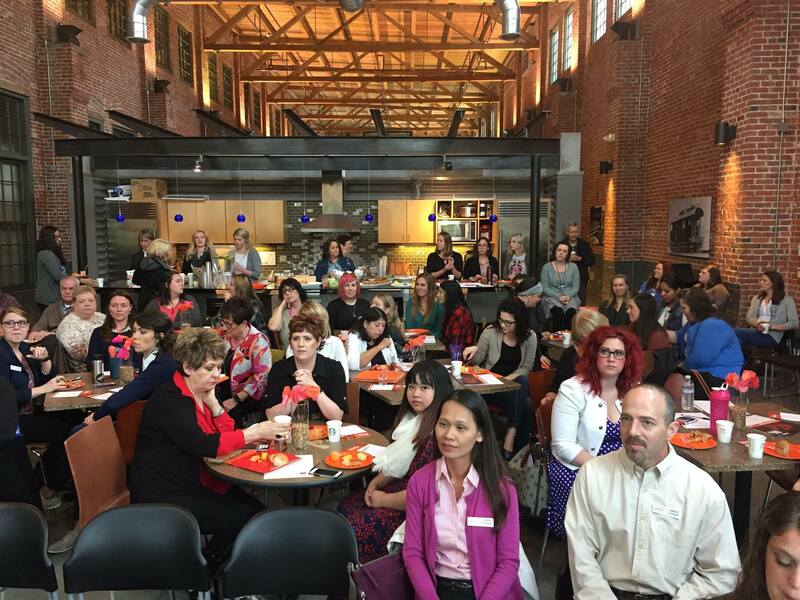 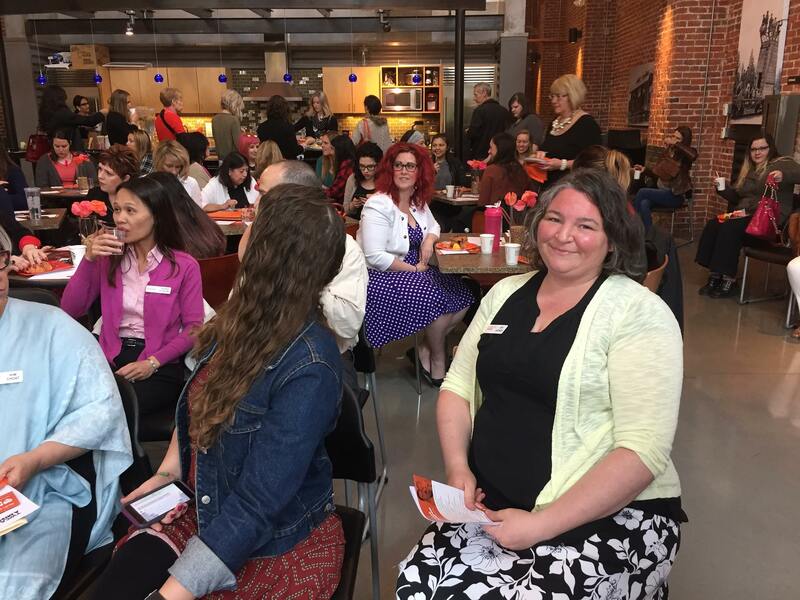 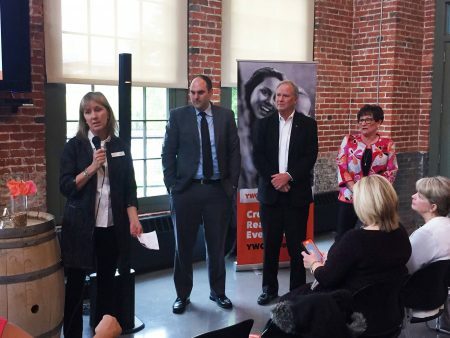 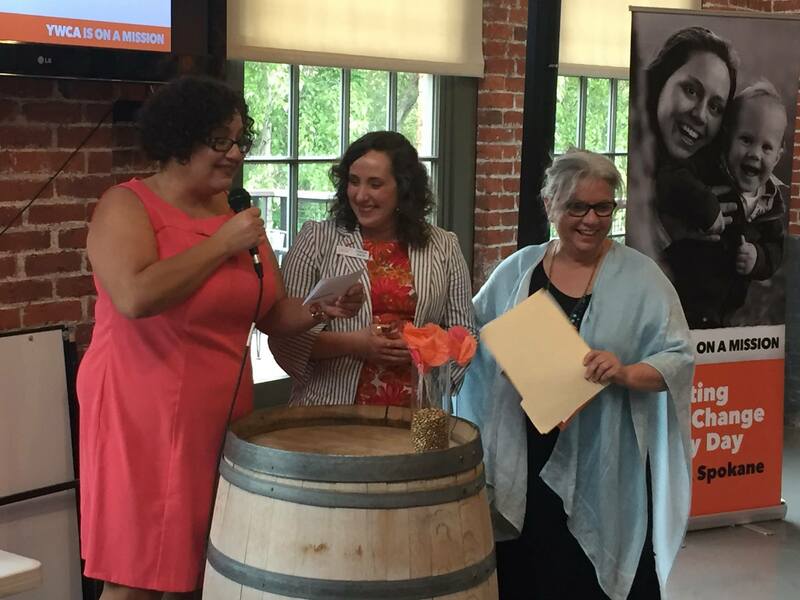 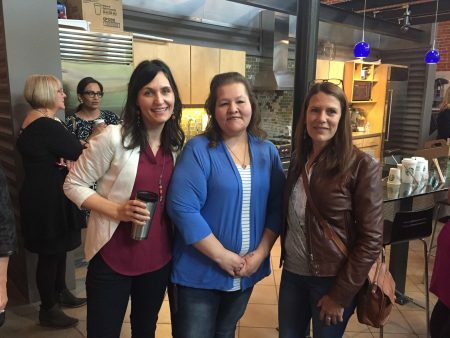 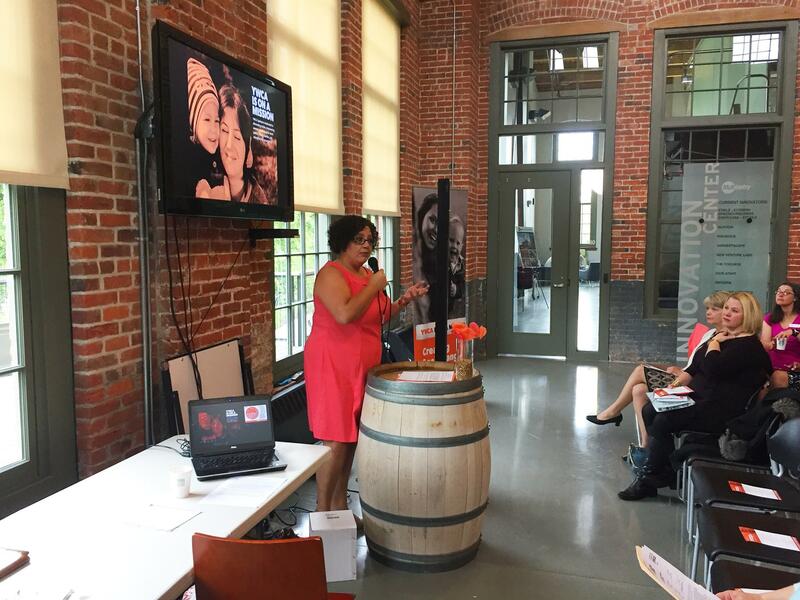 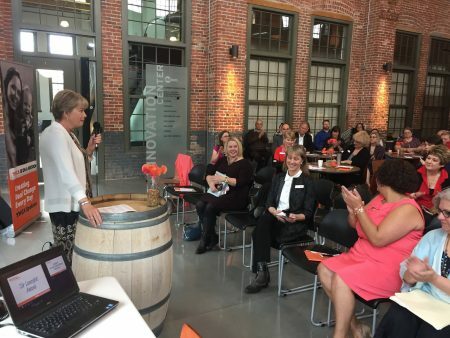 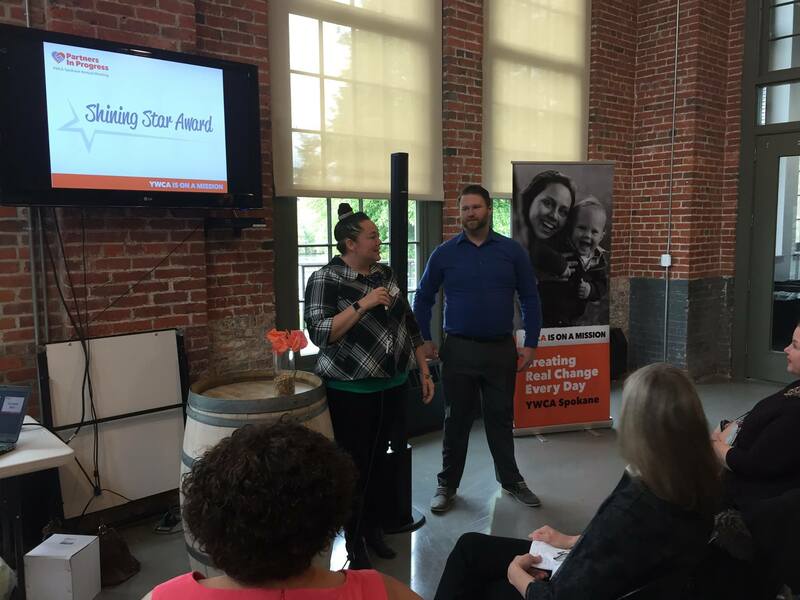 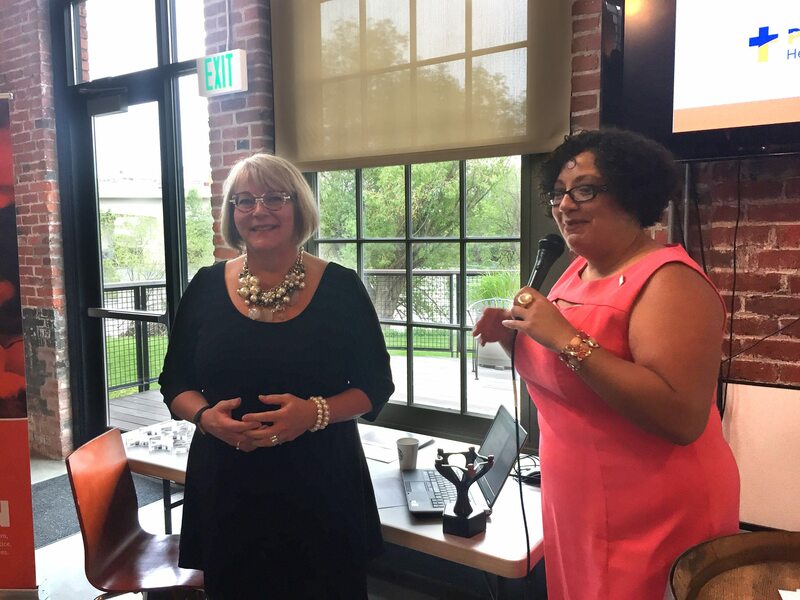 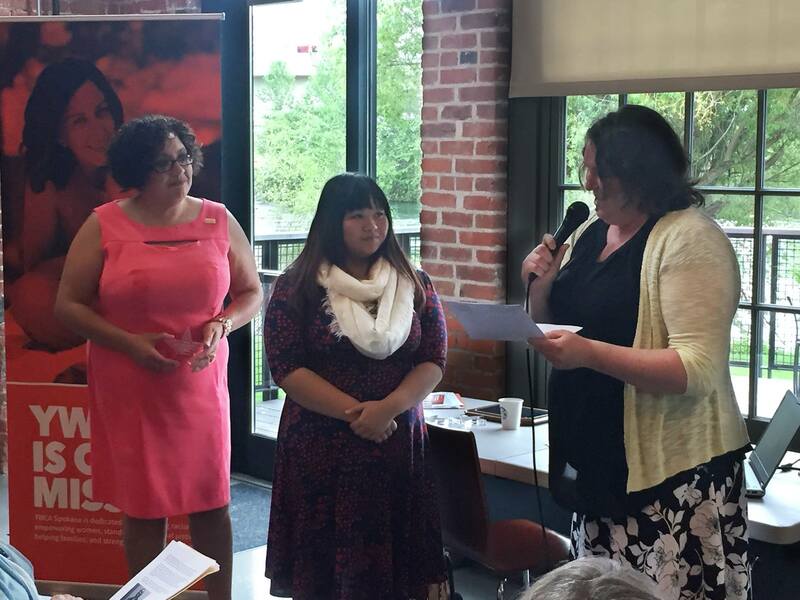 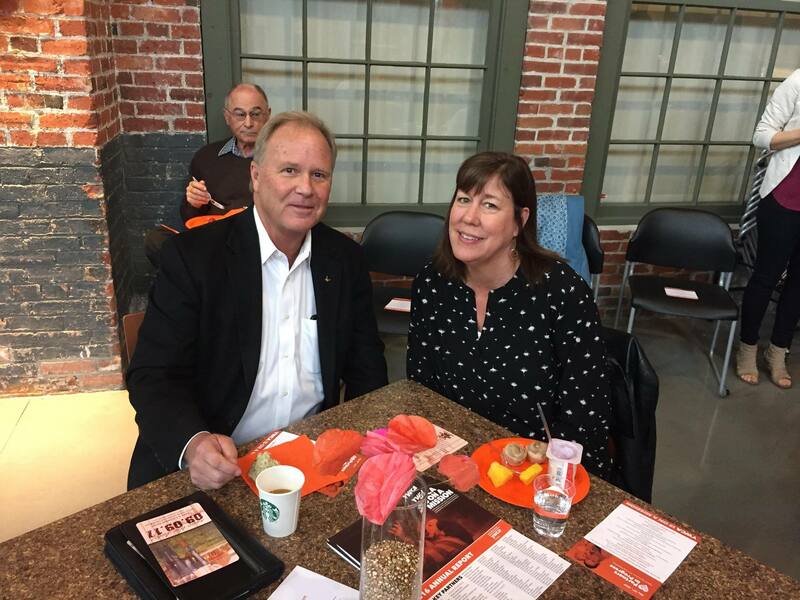 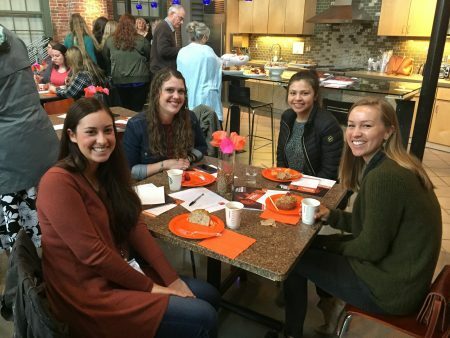 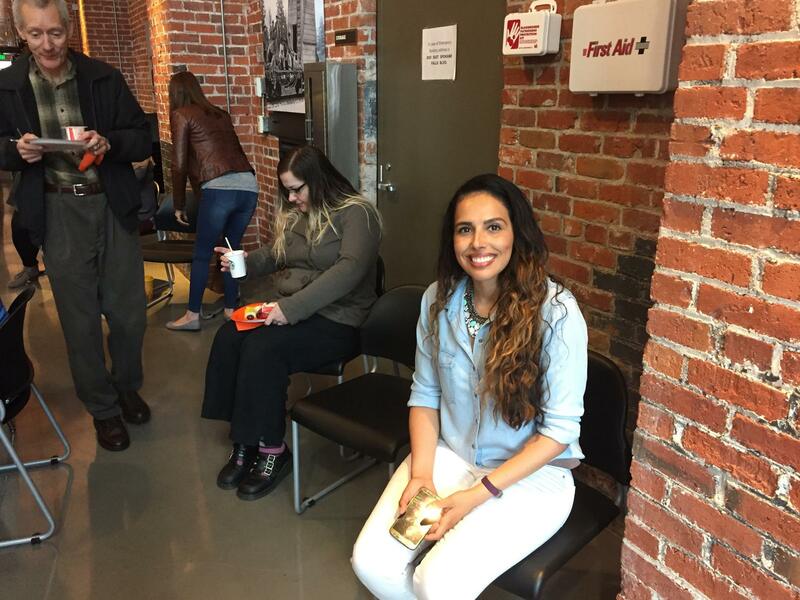 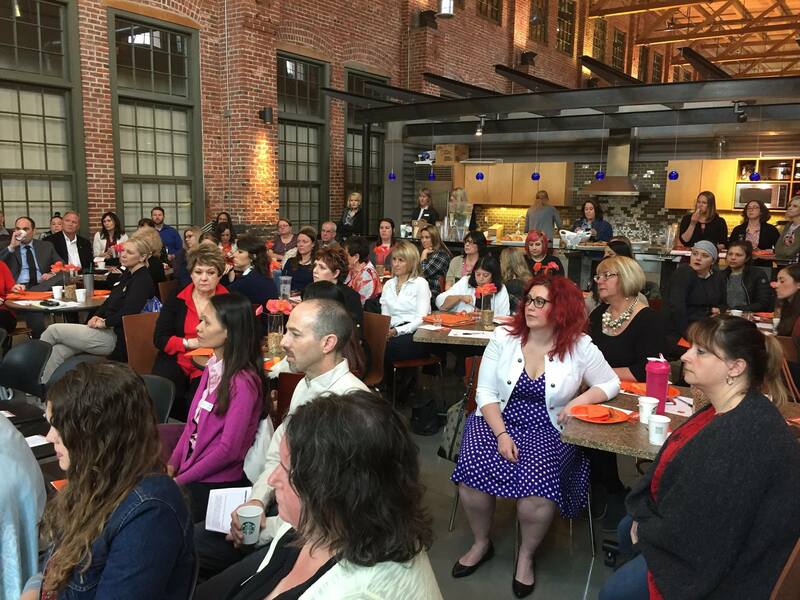 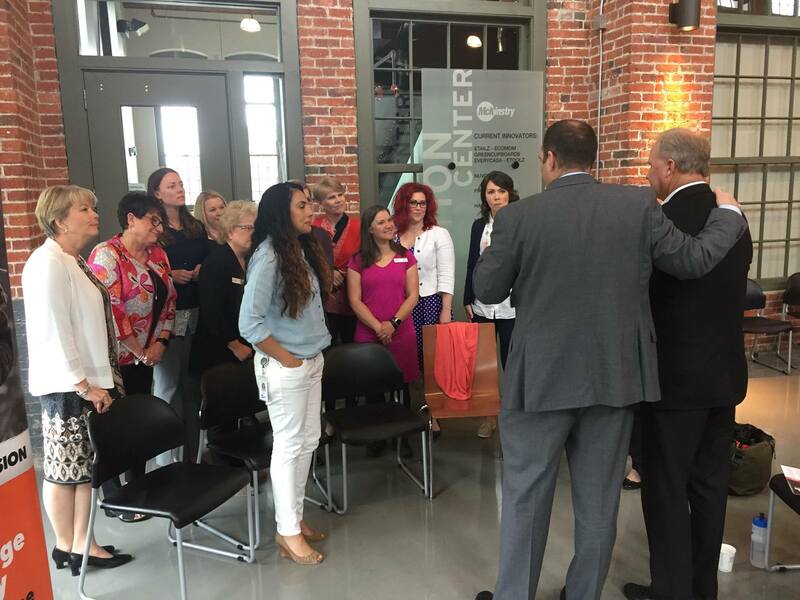 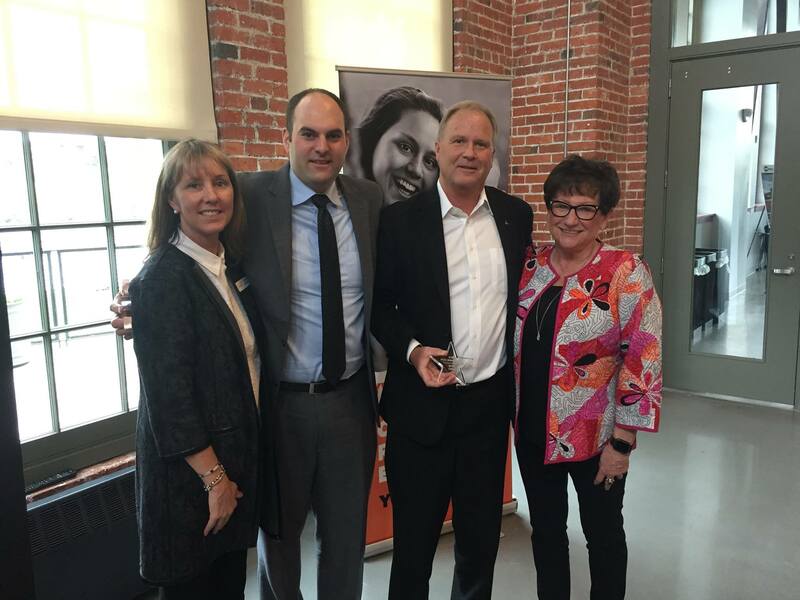 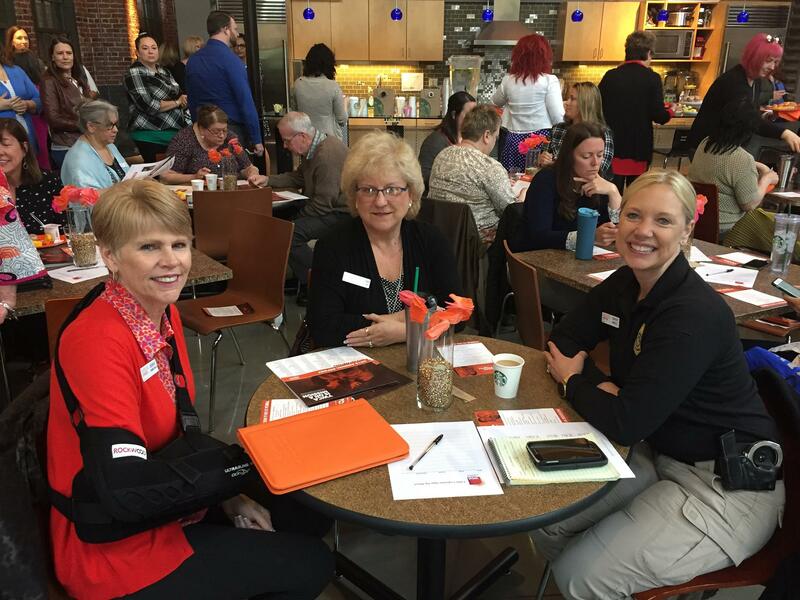 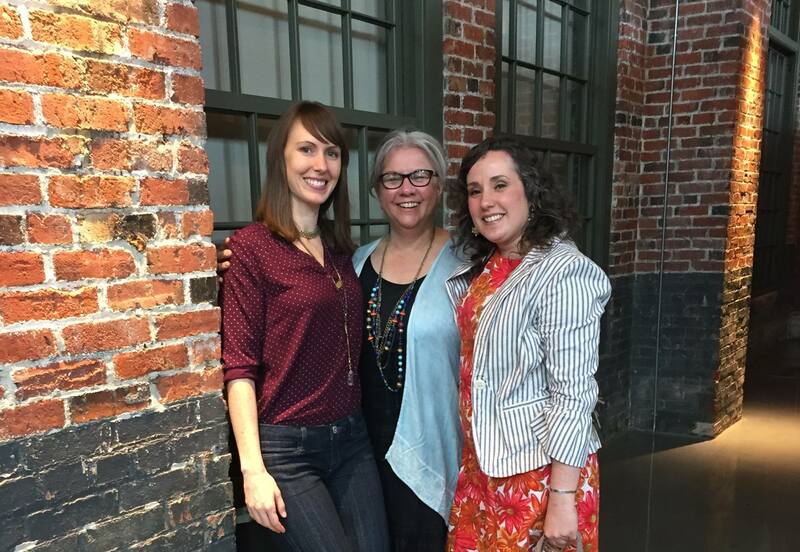 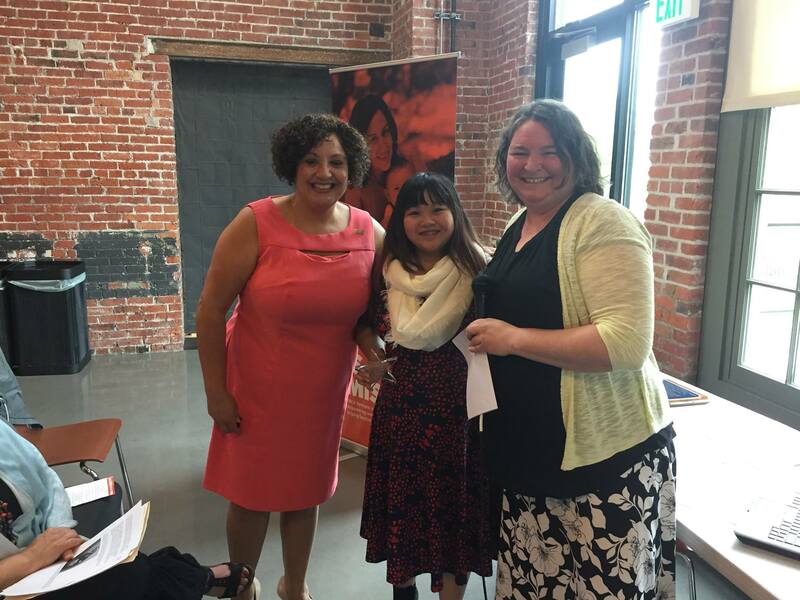 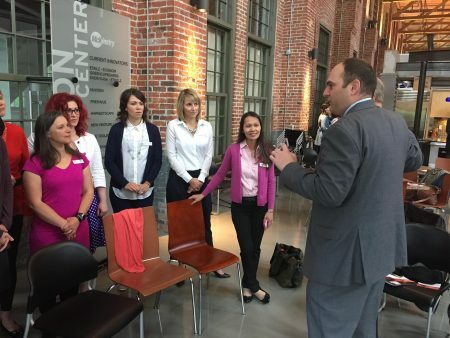 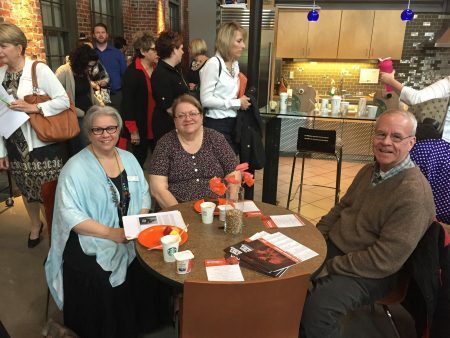 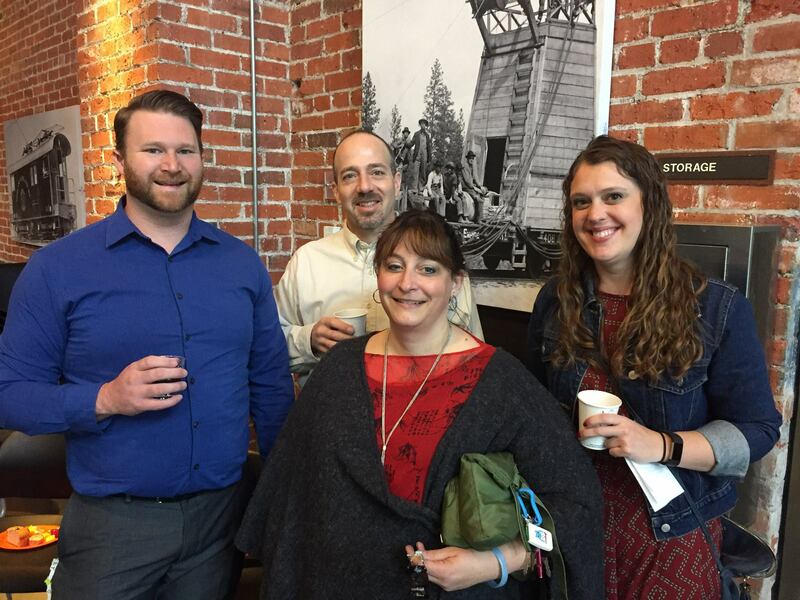 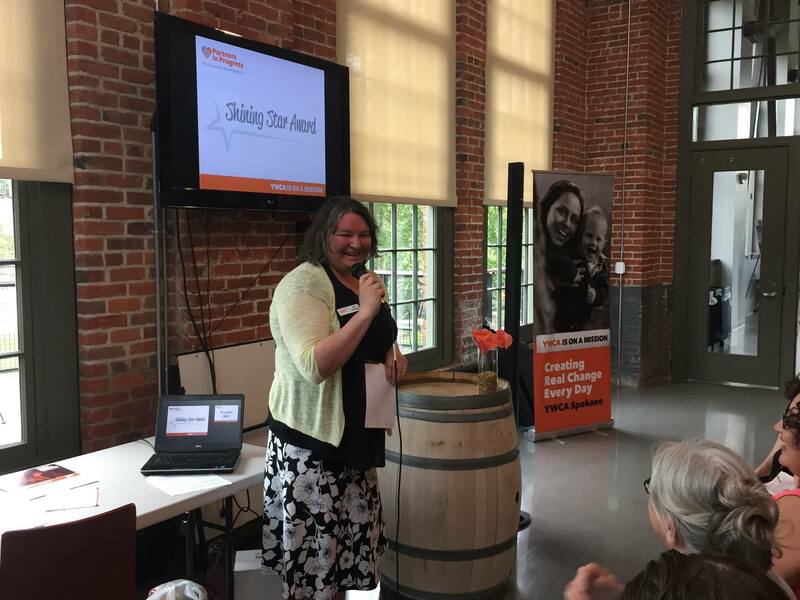 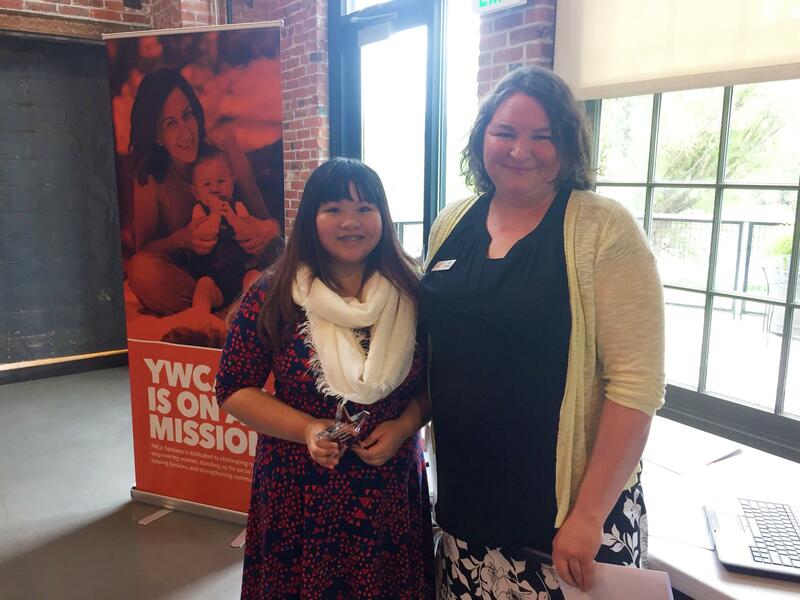 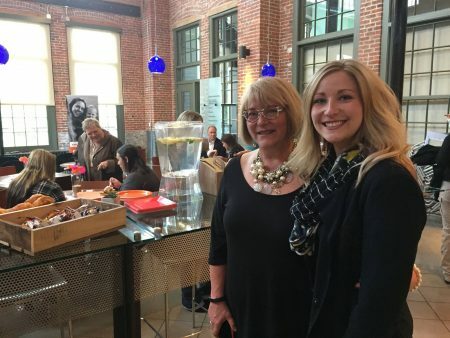 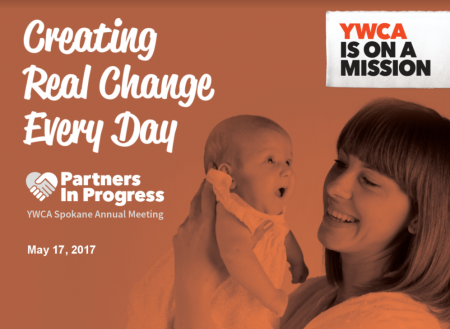 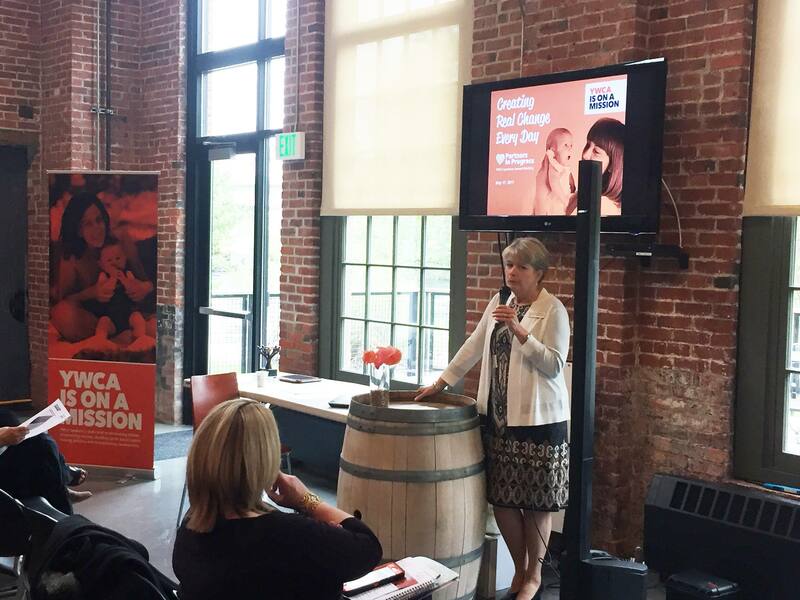 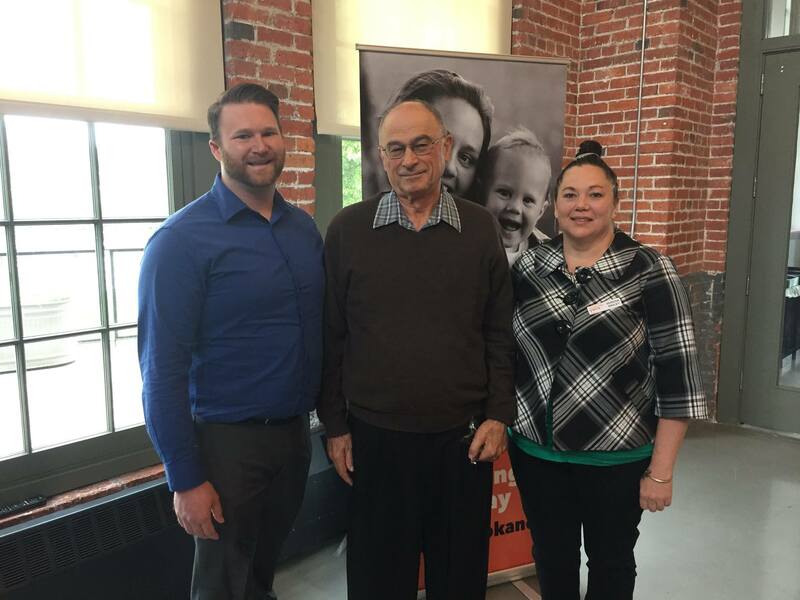 May 17th, 2017 marked YWCA Spokane’s 1st annual “Partners In Progress” annual meeting. 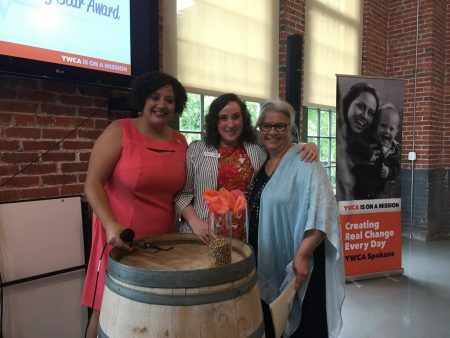 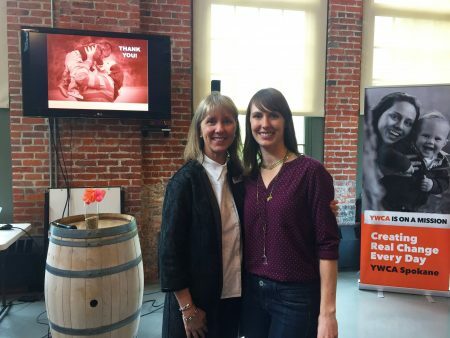 We are so thankful to the many YWCA friends, partners, and supporters who joined us as we took time to celebrate our achievements in the previous year. This special opportunity allowed us to acknowledge our collective dedication to the YWCA’s mission of eliminating racism, empowering women, standing up for social justice, helping families and strengthening communities. 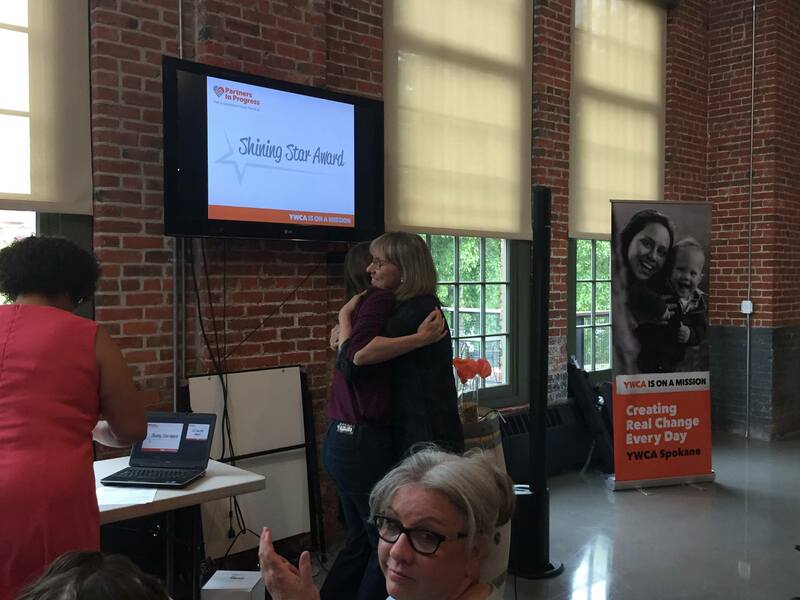 With the unwavering dedication of 75 amazing staff, 25 committee board members and over 230 volunteers the YWCA Spokane positively impacted over 17,000 women and children in 2016. 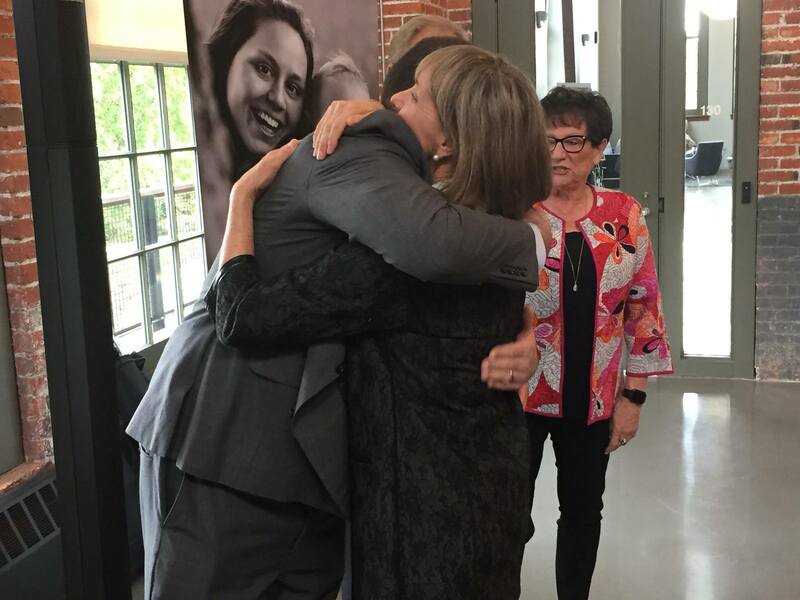 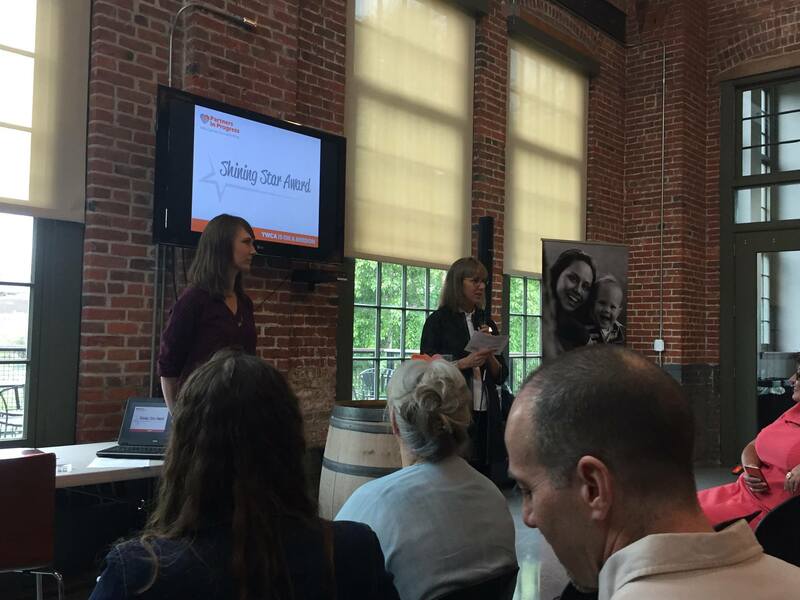 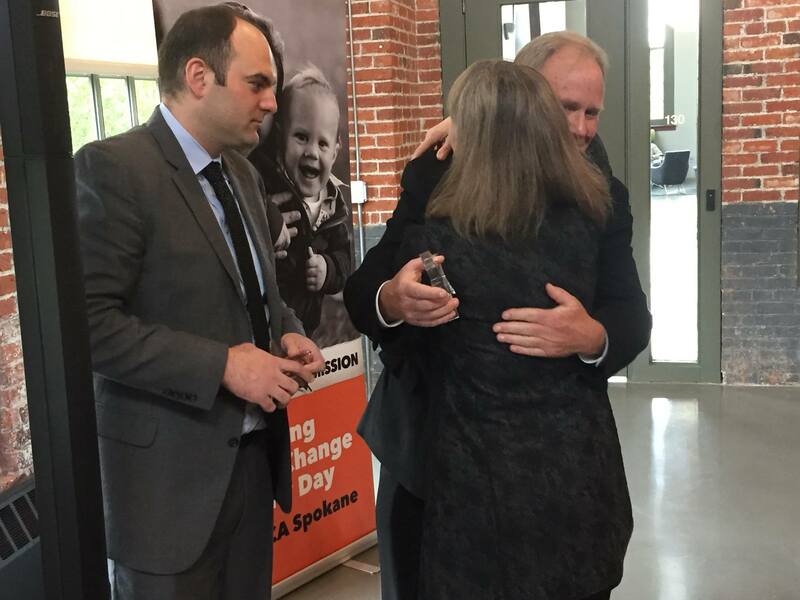 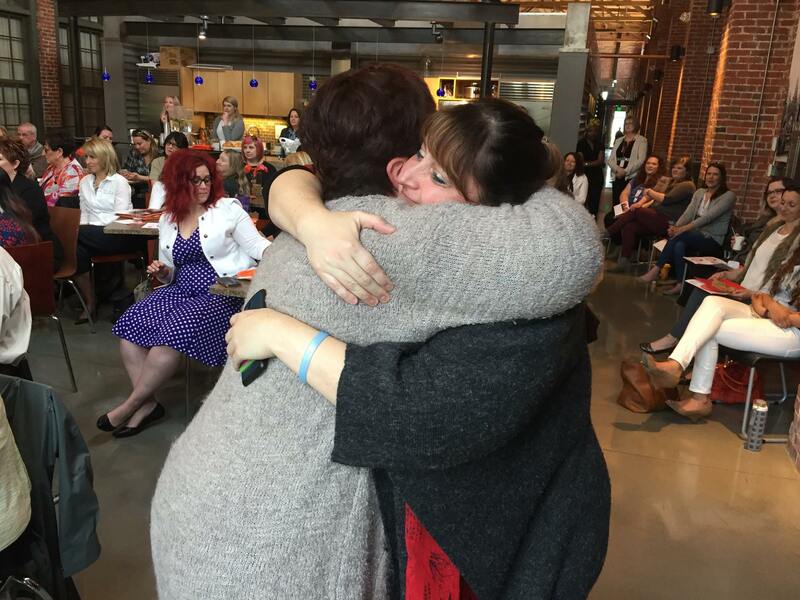 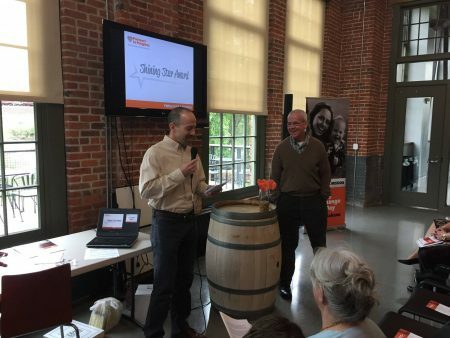 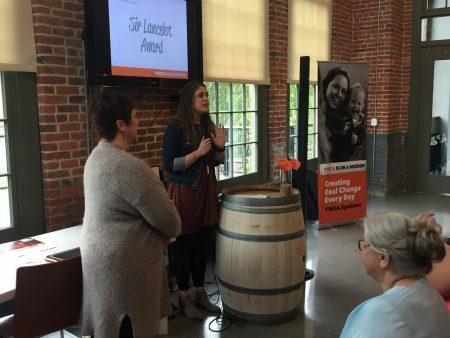 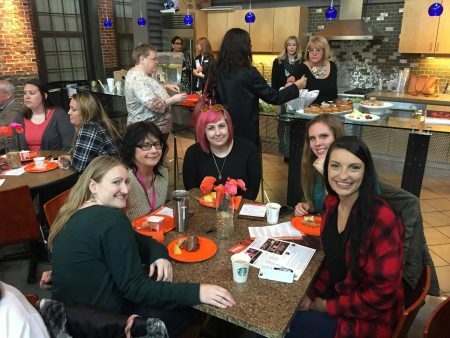 With this meeting, a new annual tradition began to honor staff, volunteers, and community partners who have made an incredible impact at our agency and in the lives of the women and children served by YWCA Spokane in 2016. This award recognizes a valued community business or organization who has proven to be a dedicated partner in support of our agency’s critical work in the community. 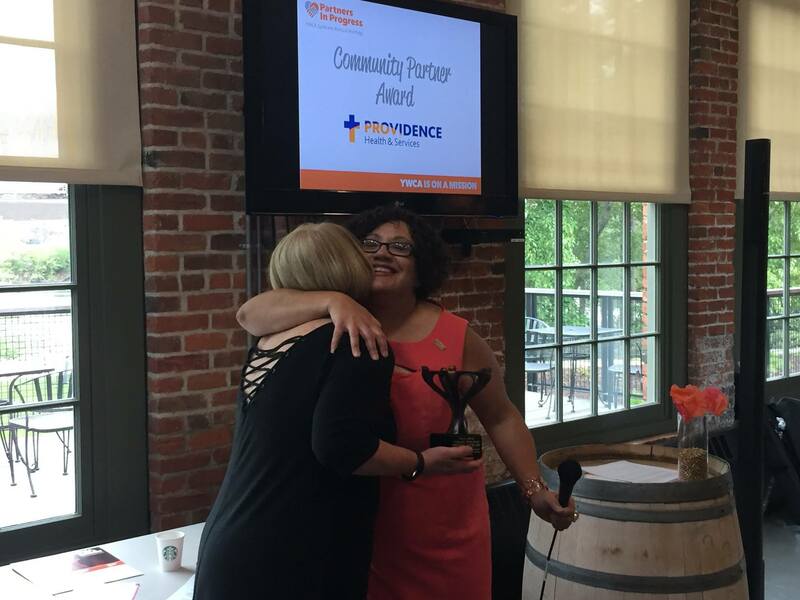 Providence Health & Services has been a long-time supporter of the YWCA as signature sponsor of our Women of Achievement Impact Luncheon and as a key program partner. The partnership has included training doctors and nurses on how to screen for domestic violence and connect victims with our agency services. We have recently expanded our partnership to include a hospital accompaniment program that will begin in July. Providence has also recently committed to becoming our first Mission Partner committing to provide sustaining support of $100,000 across three years. 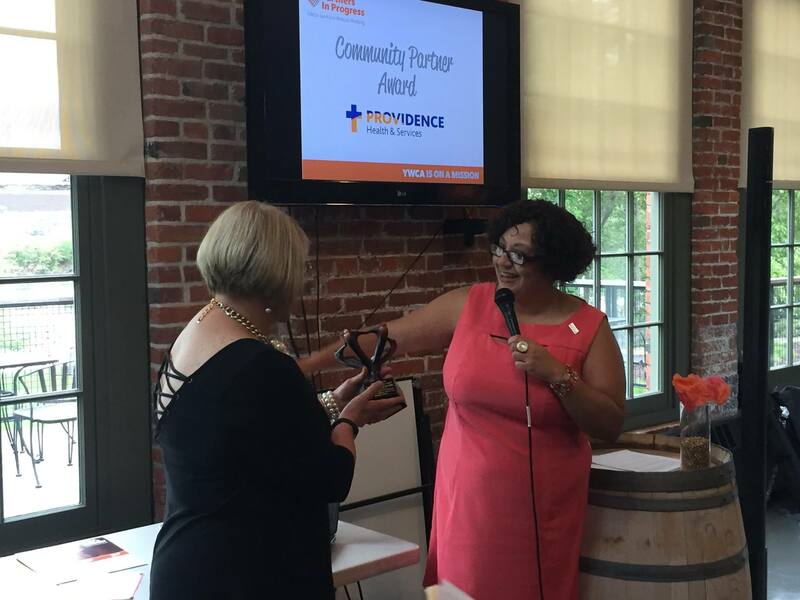 Joyce Cameron joined us to receive the award on behalf of Providence. And just as we could not do this important work without the commitment of our staff, we also rely on the extraordinary commitment of those who choose to volunteer. 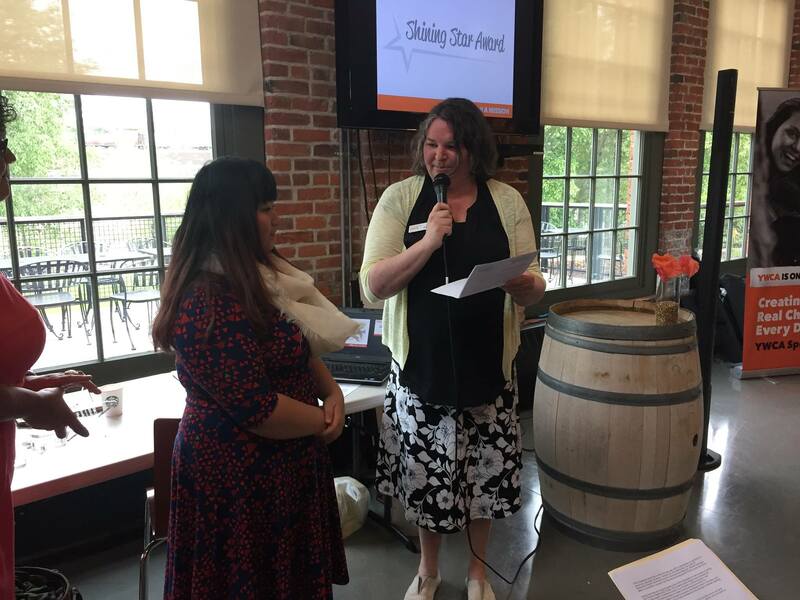 The Shining Star Award For Volunteer Contributions will be presented to a volunteer from each department who made a generous commitment of their time to our agency in 2016. 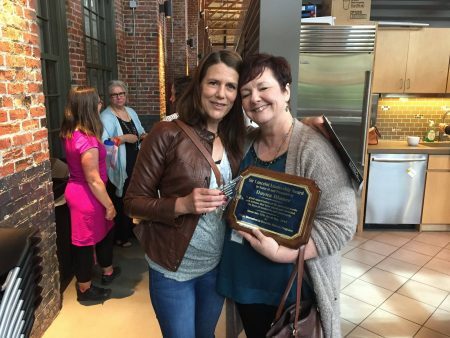 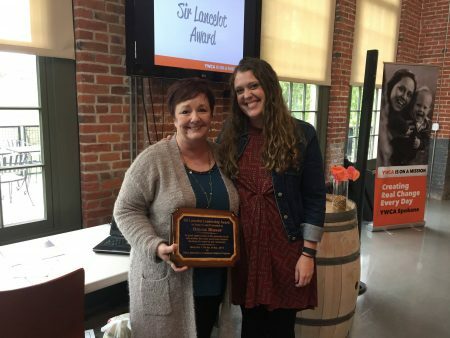 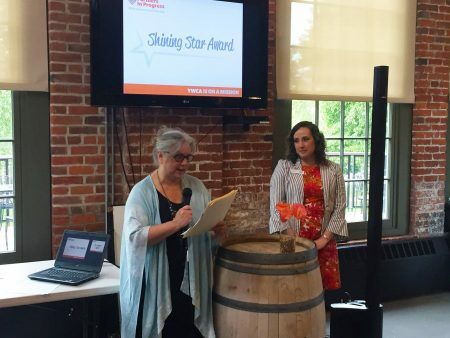 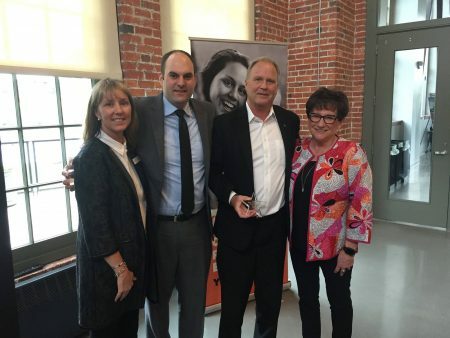 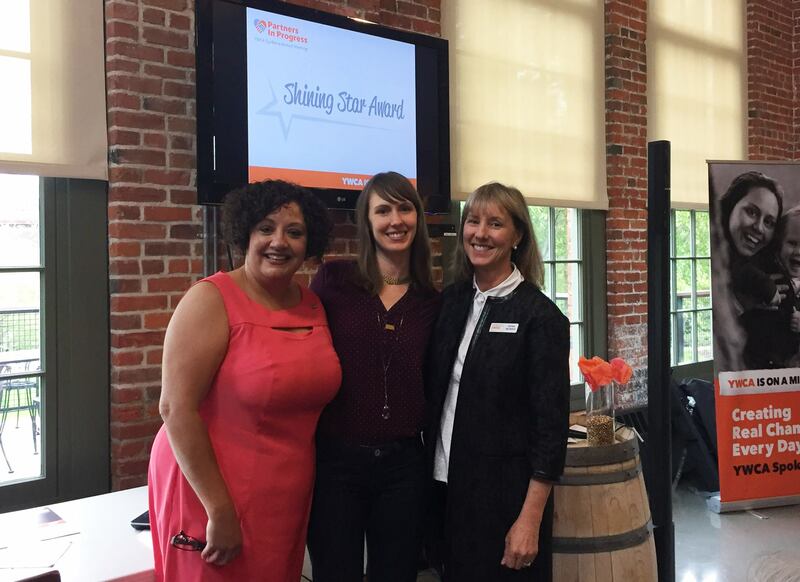 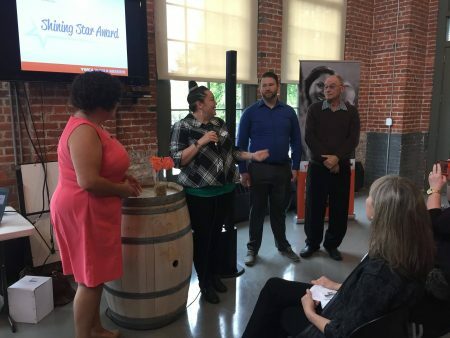 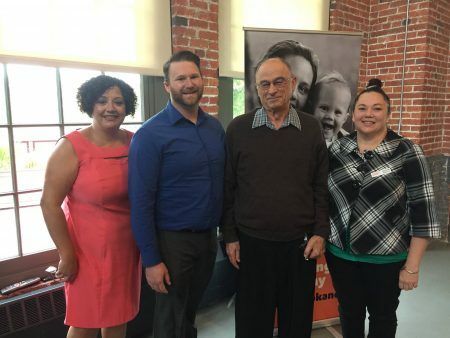 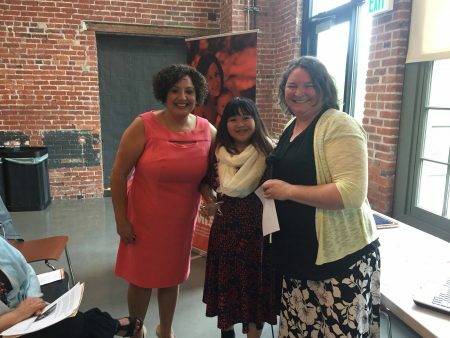 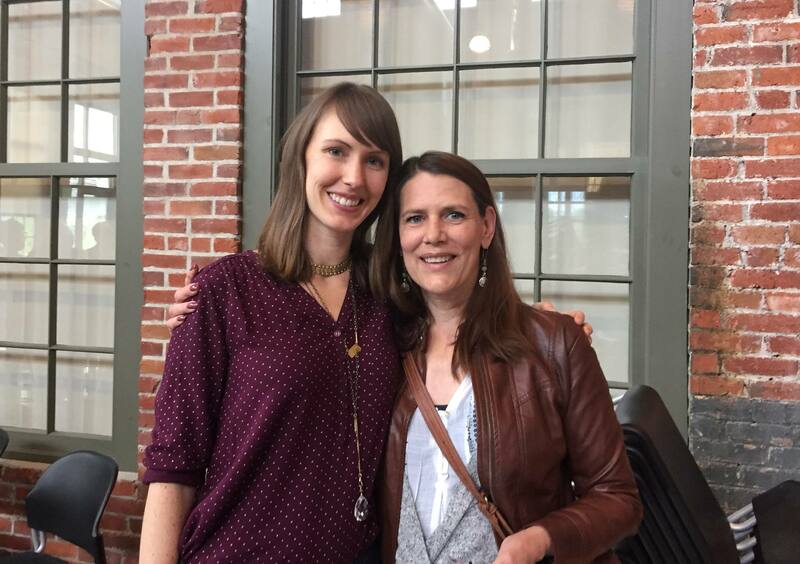 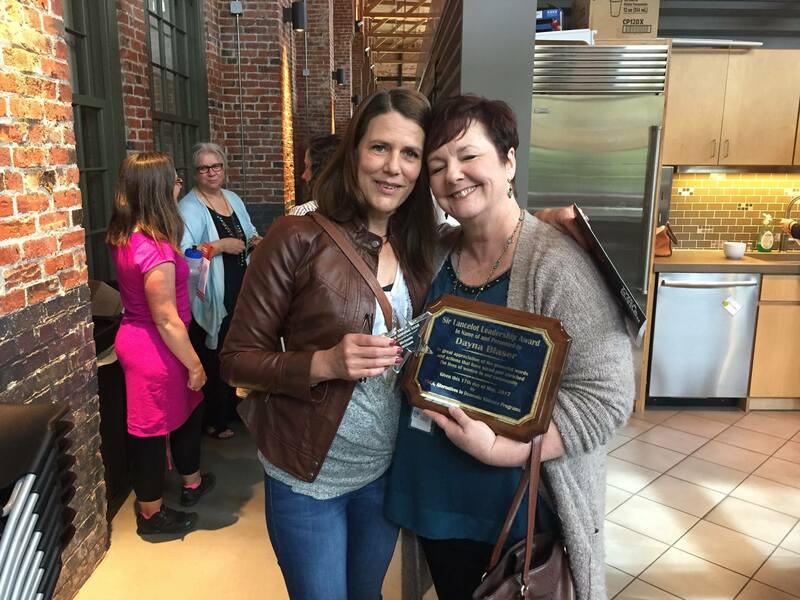 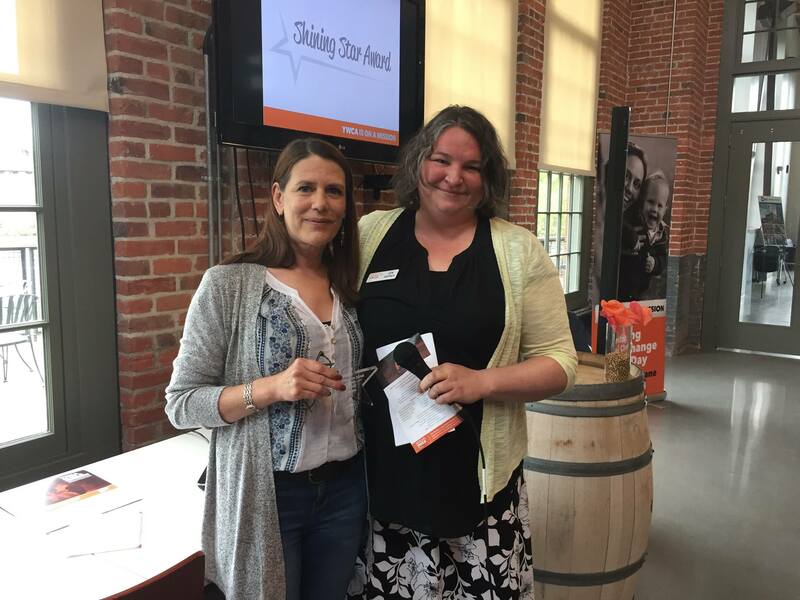 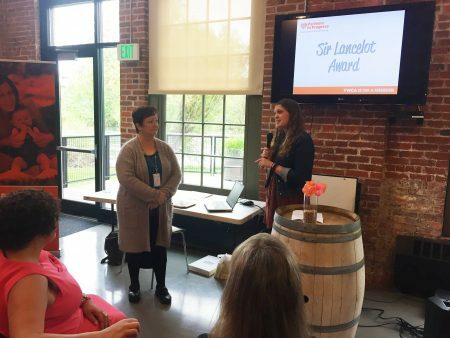 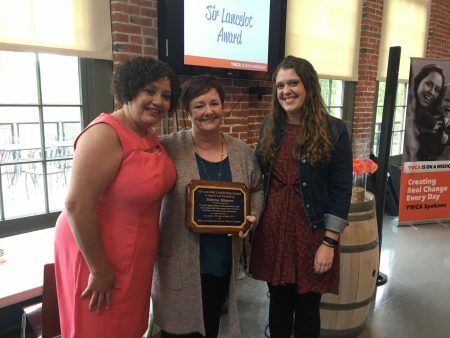 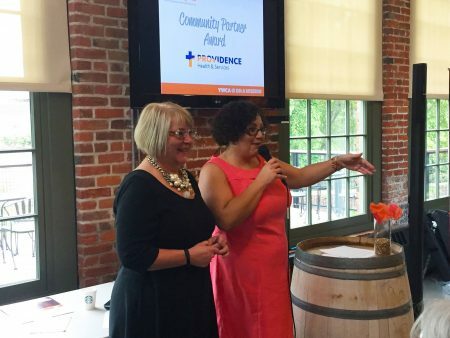 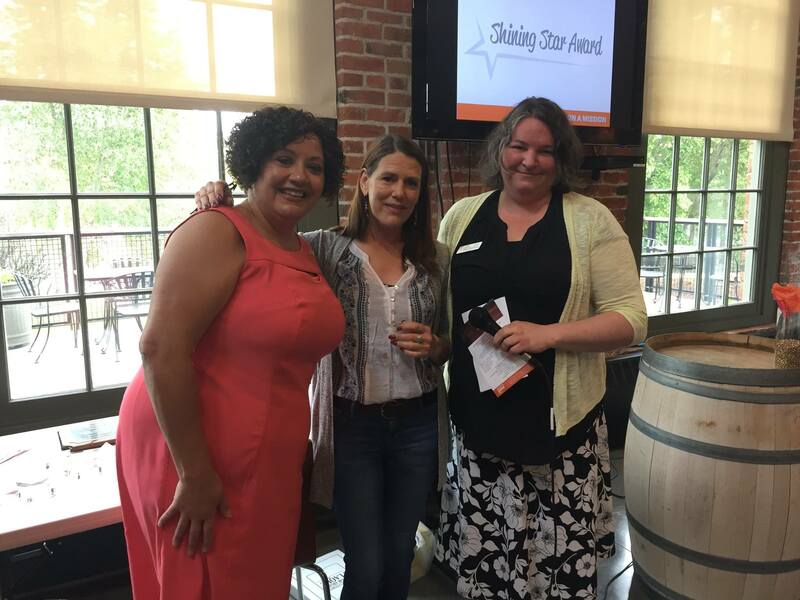 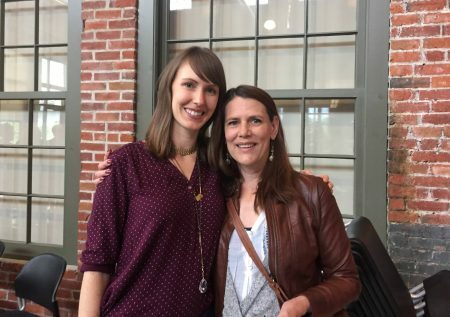 This annual award presents staff members with an opportunity to celebrate and honor a “behind-the-scenes” community member who has gone above the call of duty to assist in the YWCA Spokane’s goal of promoting safety and reducing domestic violence in our local community. 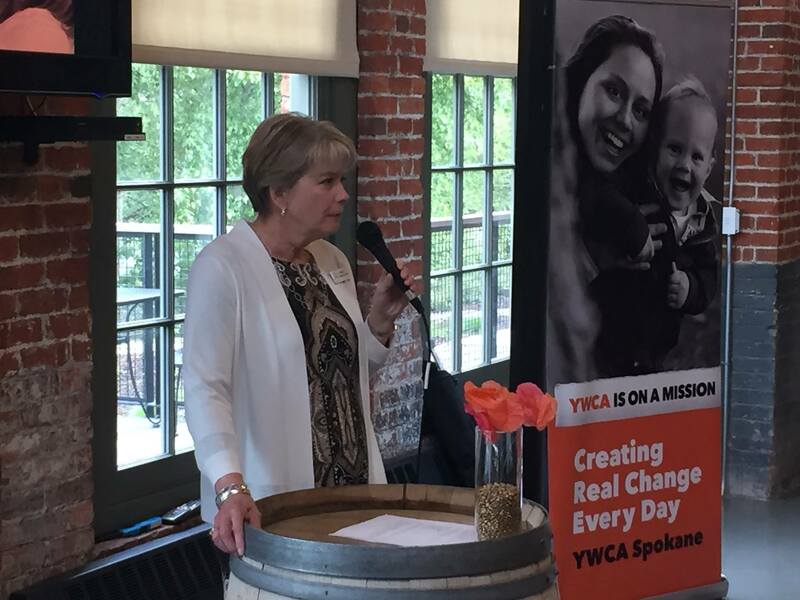 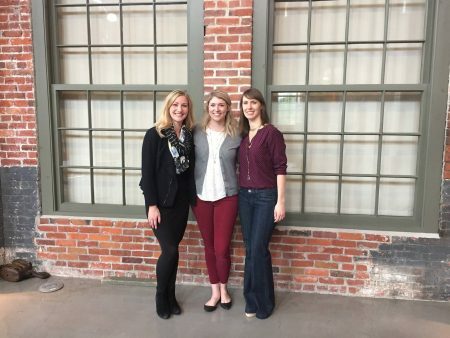 Together we continue to make steady progress in building upon our 114 year foundation of providing support to women in the Spokane community. The YWCA began as an offshoot of the YMCA and in its early years served to provide support and housing for “unchaperoned” women moving from rural areas to the city for jobs. The YWCA was also an early supporter of providing welcoming spaces for women of color and included the creation of social groups for African American women and formerly interned Japanese American women. The YWCA was also one of the first organizations to provide English as a Second Language classes to new immigrants in our community. 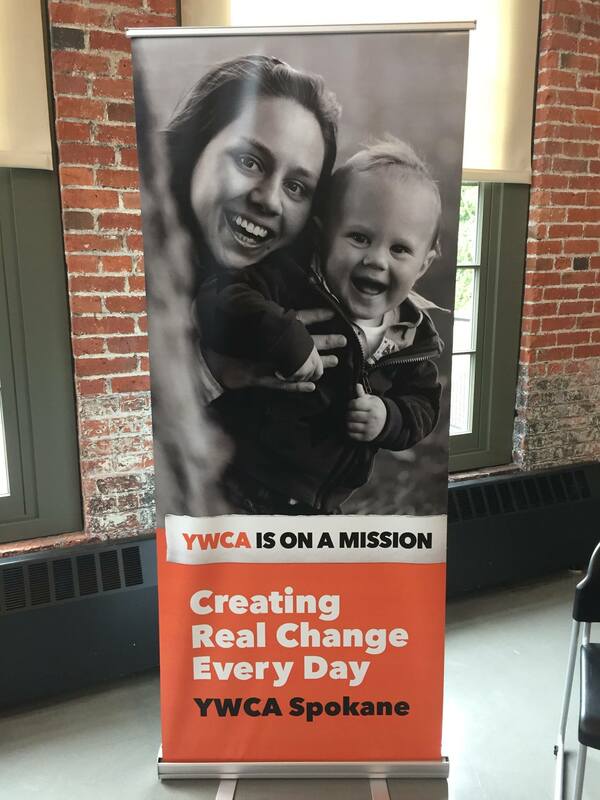 As the needs of women and families has evolved over time so has the work of the YWCA. 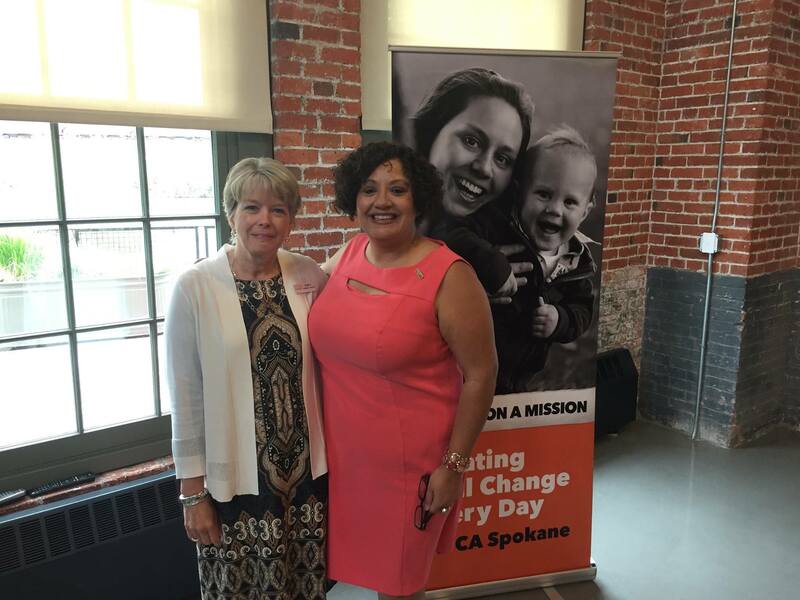 Today we are proud to offer comprehensive services supporting women and children impacted by domestic violence as well as job readiness and school readiness for those living in poverty. 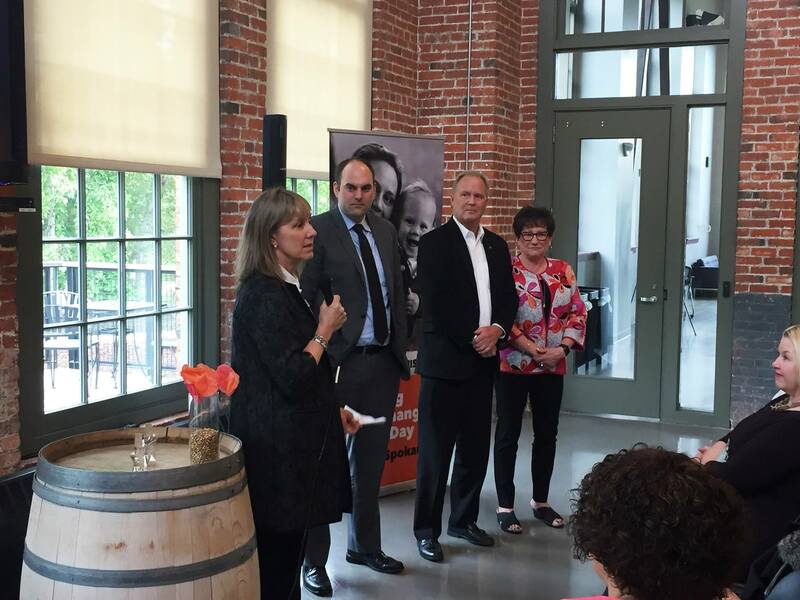 Special thanks to McKinstry for providing such a beautiful space for this special ceremony.